Owl Forest Farm is a small farm located in Forbes, Minnesota. Currently operating on 4 1/2 acres, we grow a wide-variety of vegetables and herbs that are delivered to members' doorsteps each week. We work within the framework of Community Supported Agriculture (CSA), where members pay in advance for a "share" of what the farm produces in a growing season. Our CSA season runs for about 15 weeks, from early July to October, providing a bounty of fresh, organic produce delivered straight to your doorstep or nearby designated drop site. 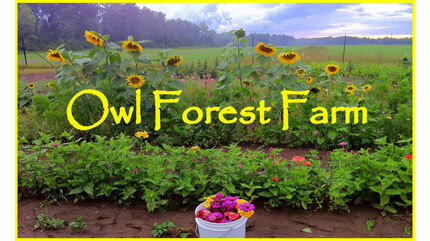 The farm complies with organic standards and practices. Compost and cover crops are used to build the soil, and NO chemical pesticides or fertilizers are ever used. Healthy for you and the environment too! There are a limited number of shares available each season, so call ahead to reserve yours today!